- RECORRIDO: CARMONA, GUADAJOZ, ALCOLEA, LORA DEL RÍO Y CARMONA (59,8 KILÓMETROS). - CIRCUITO: POLÍGONO EL PILERO. * INSCRIPCIÓN Y ENTREGA DE DORSALES: POLÍGONO EL PILERO, CALLE CANTEROS 9 (AUTOREPARACIONES ÁLVAREZ) A PARTIR DE LAS 07:30 H.
* ENTREGA DE PREMIOS RESTAURANTE "EL PILERO CASA LUIS" (C/ HILANDEROS, 11). * PREMIOS: GYMKHANA (3 TROFEOS); PRINCIPIANTES (3 TROFEOS); ALEVINES (3 TROFEOS); INFANTILES (3 TROFEOS). 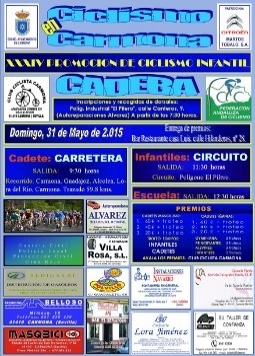 * PREMIOS CADETES: 1º, 60 EUROS Y TROFEO; 2º, 40 Y TROFEO; 3º, 20 Y TROFEO. * PREMIOS CADETES FÉMINAS: 1ª, 60 EUROS Y TROFEO; 2ª, 40 Y TROFEO; 3ª, 20 Y TROFEO.